Genius Scan attempts to automatically enhance your documents based on their content. For mostly black and white documents, Genius Scan will apply a grayscale enhancement. For color documents, Genius Scan will enhance the colors. Change the default enhancement. 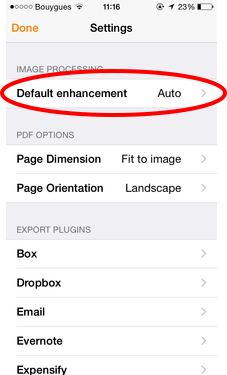 To disable the enhancement, choose None. To always apply a specific enhancement, select Black and White or Color.